Want a power supply that gets best possible tone out of your pedals? 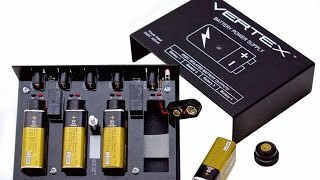 What if the answer is 9V batteries? The Battery Power Supply is designed for such “tone-purists” to use in tandem with a primary power supply for high current/voltage pedals (like a Voodoo Lab Pedal Power), while the Battery Power Supply provides optimized 9V power to your favorite overdrive, distortion, fuzz, and/or wah pedals. Fast delivery and great product. Meanwhile my second Battery-Box, which has become indispensable for me. Overdrives and distortions sound better with batteries. Just what the Doctor ordered! 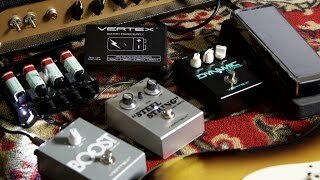 The Vertex Effects Battery Power Supply is the ideal/perfect solution for those pesky little pedals that just insist on good'ole 9 Volt DC Battery Juice in order to sound right! Very well made, solid little box that is so simple to operate....I have been dreaming about such a device as this! Now go out and getcha one, or do like I did and order one direct from Vertex Effects Inc.